Ken Gonzales-Day, “Americas (Large constellation): Mexico (unless noted), “Dog; Standing Dog; Dog with Human Mask; Baby Figure;Columbia, Figure with Ligatures on the Arms and Legs; Standing Female Figure; Standing Male Figure; Man Using Tumpline to Carry Vessel; Standing Couple, Male Figure; Seated Figure; Seated Female on Bench; Columbia, Hollow-slab Seated Female with Geom Designs; Seated Male Figure; Male Seated on Bench; Hunchback; Seated Couple; Joined Couple (all LACMA), 2019, 40 x 50 in., archival ink on Canson PhotoSatin paper.Courtesy of the artist and Luis De Jesus Los Angeles. Opening May 2 through 5, 2019, Frieze New York will showcase a cross-section of work, from emerging artists to seminal figures of the 20th century alongside new exhibitions, sections and collaborations. The section entitled Diálogos, curated by Patrick Charpenel and Susanna Temkin, will focus on the work by contemporary Latinx artists. The presentation coincides with El Museo del Barrio’s 50th anniversary and they invited a select number of galleries to present works by artists who “played a significant role in El Museo’s history,” according to one release. Many of the works photographed are rarely displayed, are used for teaching, or are being within the field of art history, as is the case with, for example with Latin American Art and the Art of the Americas. Today, some objects might be seen as “possessions,” spiritual objects, or ancestor figures. In representing these works, Gonzales-Day invites us to consider the dual role of every museum object – part visual expression of the maker or makers; and part historical artifact within a larger cultural, institutional, disciplinary narrative, or what Michel Foucault characterized as the politics of the imagination. If for Foucault, the museum was a culture machine, then for Gonzales-Day, it is precisely the site from which to begin any critical excavation, artistic recuperation, or cultural reconciliation. However, Gonzales-Day does not simply echo the importance of applying a critical framework for thinking about museum collections, he also provide a model when he employs LACMAs encyclopedic museum collection in order to bring attention to works already in the collection. The mermaid, the slave, the hunchback, the toothless Mexican or aged god, the androgynous form of Shiva and Parvati, are just a few the figures to be foregrounded. For Gonzales-Day, these and other objects suggest the recuperative potential of a proposition which sees the ever-expanding universe of museum collections as a universe filled with its own dying stars and dark holes from which to highlight, not only what is present, but what is missing as well. One such “constellation” considers the sculptural works of Auguste Rodin whose own embrace of modern casting techniques led to the wide-spread distribution of his work in plaster and bronze, an approach that was seen by his critics, and later scholars like Rosalind Krauss, as marking the end of the unique art object and introducing the idea of the edition to the art world. These modern technologies were also employed by academics and educators to make and distribute plaster copy casts of sculptural works from Antiquity to the Renaissance to aid in the instruction of drawing and painting, and firmly establishing western canons of beauty, and whiteness itself. It was after all, the 18th century art historian Johann Joachim Winckelmann (1717-1768) who established the still-active myth that all classical sculpture were white. They were not. Scholars have now clearly documented that classical sculptures were often painted or polychromed. However, Winckelmann’s fascination with whiteness quickly spread and in the academy and white plaster and marble copies soon found themselves in classrooms, museums, and colleges from Mexico City to Japan. In Copenhagen, plaster casts were carried into the very same ports as the goods that were produced from slavery. The Aphrodite constellation includes plasters photographed at the Royal Cast Collection and the Philadelphia Academy of Fine Art and speaks the nineteenth century conflation of female beauty with whiteness. It could also be said that the wealth acquired through the exploitation of slave labor helped found some of our Nation’s most revered universities and colleges, these colleges regularly deployed plaster copies, not only in the instruction of drawing in painting, but in teaching the humanities as well. Indeed, such casts were also used to civilize whole nations, as was the intention behind Copenhagen’s Royal Cast Collection, according to the museum’s curator. Perhaps ironically, Rodin’s own artistic skill was questioned when he was accused of casting his model, a young Belgian soldier by the name of Auguste Ney, in plaster. The final bronze version was briefly known The Vanquished but later retitled as, The Age of Bronze when it was exhibited in the Salon of 1877. The bronze was cast by Alexis Rudier in Paris and stands at the center of the Rodin constellation. Ken Gonzales-Day, “Rodin: Auguste Rodin, The Age of Bronze (Auguste Ney) aka The Awakening Man (PAFA, Philadelphia); encircled by Rodin’s The Shade, Kneeling Female Faun, Eve, Marsyas aka Torso of The Falling Man, and Monumental Head of Pierre de Wissant (LACMA),” 2019, 40 x 50 inches, archival ink on Canson PhotoSatin paper. Courtesy of the artist and Luis De Jesus Los Angeles. As an artist and scholar, Gonzales-Day reconsiders cultural artifacts and continues his efforts to locate, identify, and share, objects which have in some way contributed to our understanding of cultural difference, just as his much cited Erased Lynching Series, helped raise awareness of the lynching of Latinos, Native Americans and Asians in the American West.With Constellations Gonzales-Day takes a closer look at museum collections as a way of thinking about missing histories. Working with museum directors, curators, collection management professionals, and other stakeholders, Gonzales-Day has identified, located and photographed hundreds of works in museum collections as a way mapping out the material remains of white racial formation in art and art history. But white racial formation is not the only cultural identity to be found. 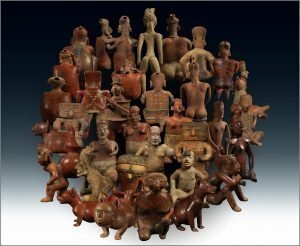 In Americas (large and small constellation), Gonzales-Day has assembled works from LACMA’s Ancient Americas collection.The museum’s pre-Columbian collection was built around a gift from Southern California collector Constance McCormick Fearing and a purchase from businessman Proctor Stafford. More recent additions include donations from Camilla Chandler Frost, sister of Otis Chandler, and Stephen and Claudia Muñoz-Kramer of Atlanta, has brought the collection total close to 2500 objects. The works assembled in this image represents a point of cultural pride for Gonzales-Day, who continues to look for, and track, Latinx representations of any kind in museum collections both locally and nationally. The piece also hints at the historical divide among collectors and scholars who have historically embraced Latin American Art but often failed to see contemporary Latinx artists as either American, or Latin American enough to collect or study. With Constellations, Gonzales-Day offers us a glimpse of the future. It is a future in which the marginalized must claim absence and historical erasure as their own as they transform that absence into a site of contestation from which to make visible, the material legacies of conquest, colonialism, and yes, museum display.